Truro City could move to Devon if the permission to build a new stadium for the National League South club is not granted, says chairman Peter Masters. Cornwall planners approved the plans in July, but it has been referred to the Department for Communities and Local Government's Planning Casework Unit. 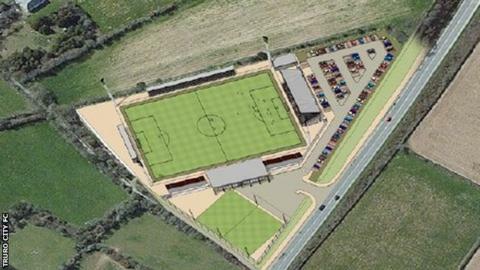 Truro hope to move into the ground on the city's outskirts in July 2016. "We will just go up to Devon and stay up there until, to be frank, everyone gets their act together," he said. In May, Masters revealed that he had been in talks with National League club Torquay United about sharing at Plainmoor. Both Truro City's ground at Silver Bow and the Stadium for Cornwall, which will house the Cornish Pirates, were approved at the same planning meeting. A retail park will be built on Truro's current Treyew Road ground, with the sale of the site helping to fund the new stadium. But major infrastructure projects are often referred to the Planning Casework Unit and some are referred up the Secretary of State for his approval. "We are ready and set to go," Masters, who took over the club in 2012 after it went into administration, told BBC Radio Cornwall. "The problem we've got is that it's been referred up the line. "We've got to have something by 31 March, we've got to have our stadium built by July next year, and if it doesn't work then we are off and we're going straight to Devon. "There's no ifs and buts, it's not an idle threat, there's nothing else I can do."